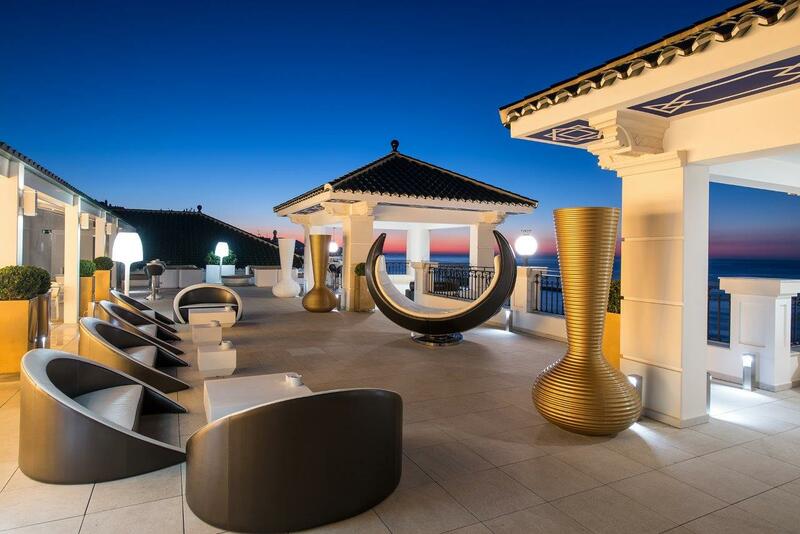 The maritime city of Malaga, de-facto capital of Andalucía’s world-famous Costa del Sol, and capital of its province, has been welcoming international visitors for decades. It has long been the gateway to the beach clubs and resorts of southern Spain; yet in recent years it has become a fashionable city-break destination, renowned for its cuisine, climate and culture, writes Andrew Forbes. 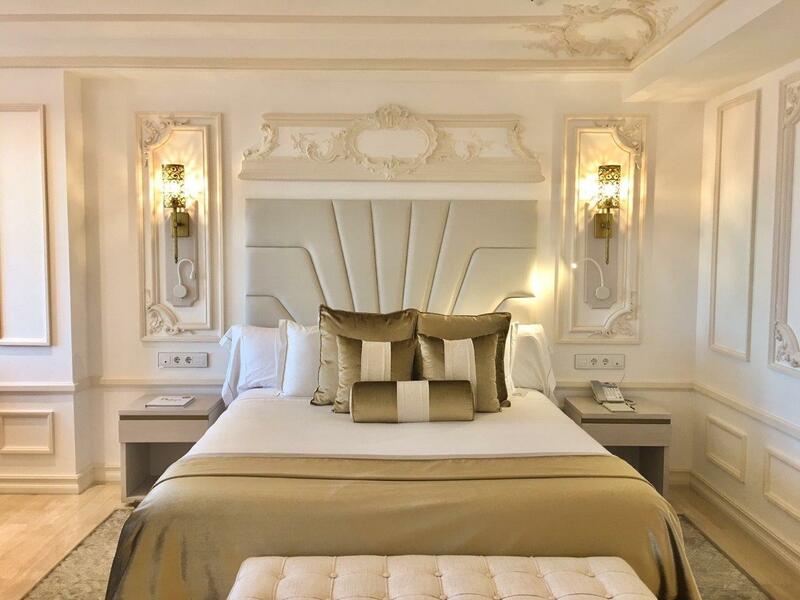 Now, this regional capital once again has an iconic, grand dame hotel, the Gran Hotel Miramar Malaga, a member of Leading Hotels of the World. 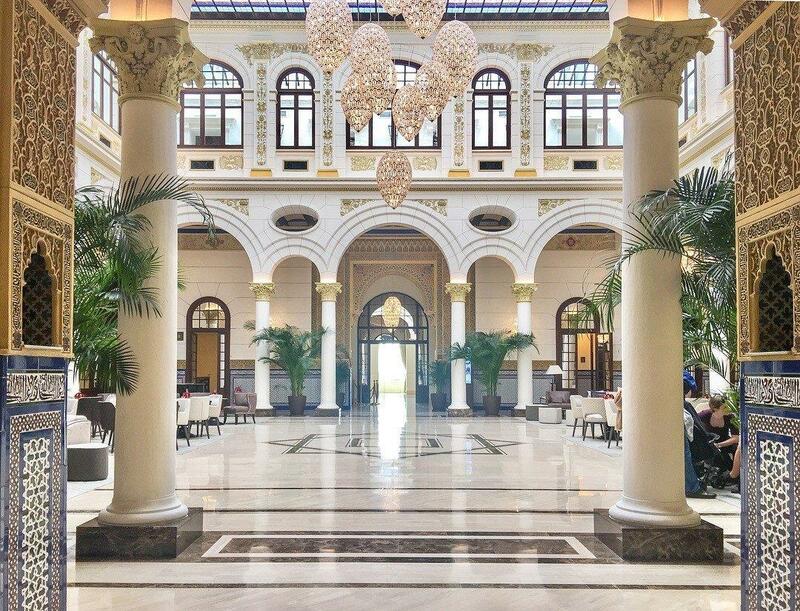 This historic property has been open for a little over a year and is now fully-established as the coast’s most emblematic luxury city hotel – so it’s the perfect time for The Luxury Editor to check-in for a weekend of discovery. This Miramar Palace has real impact when one arrives. If you transfer by taxi, the car will pass through the hotel’s landscaped sub-tropical gardens and draw up outside the imposing entrance – where you will be met by a uniformed porter. 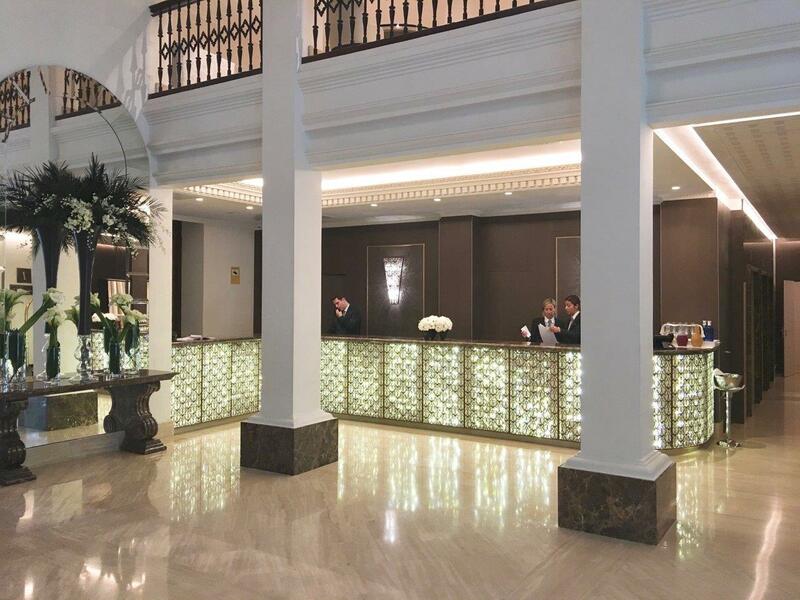 Once inside you are greeted by the team behind the sparkling crystal reception desk flanked by extravagant fresh flower arrangements – yes, this feels like a Grand Hotel. 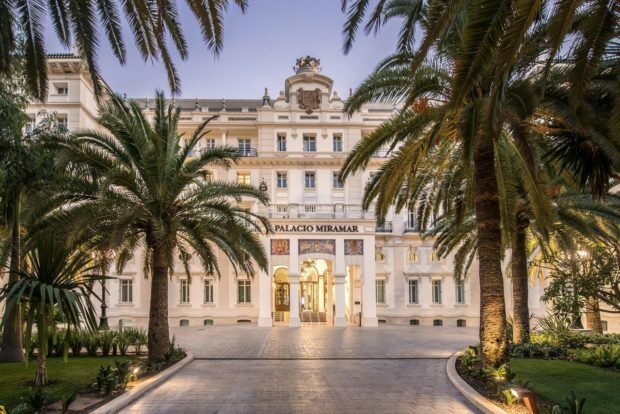 The Palace may have the sparkle and shine of a new luxury hotel, but the truth is that it has a fascinating heritage, reflecting the history of Malaga and Spain. 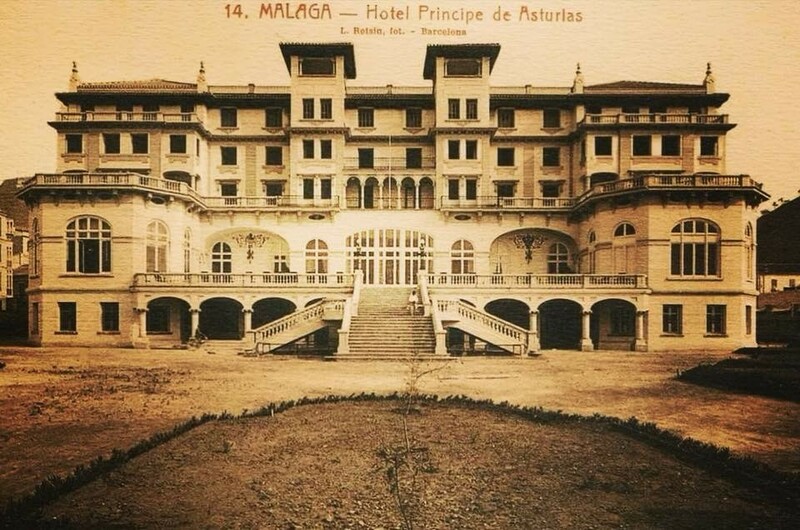 Conceived by architect Fernando Guerrero Strachan, the hotel opened in 1926 as the ‘Hotel Príncipe de Asturias’, inaugurated by King Alfonso XIII. The hotel was at the centre of glamour and style for a decade before closing during Spain’s civil war. The iconic Royal Crown that sat above the entrance was torn down; and the property was requisitioned as a field hospital. In the 40s, 50s & 60s The Miramar Palace was once a hotel again welcomed guests from across the world, including Elizabeth Taylor. As the focus for tourism shifted away from the city, this grand building became the city’s law courts before being abandoned and falling into disrepair in recent years. 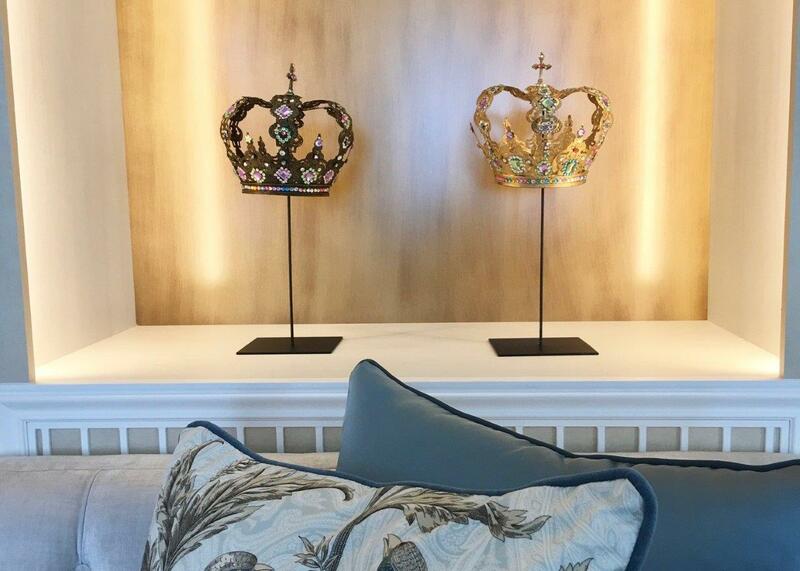 The new chapter is this compelling story was written by Hoteles Santos, a Spanish family-run hospitality group, which has since brought the hotel back to life, replacing that destroyed royal crown, and adding a sparkling new lease of life to the building. 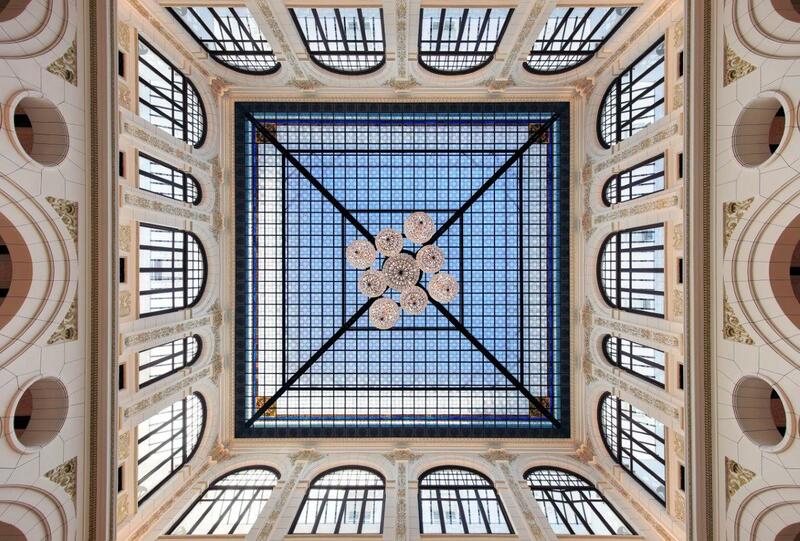 The lofty central atrium has been restored, its glass ceiling allowing the Mediterranean light to flood in. The Moorish revival arches, intricate plaster relief carvings and the period tiles are all in perfect condition once more. 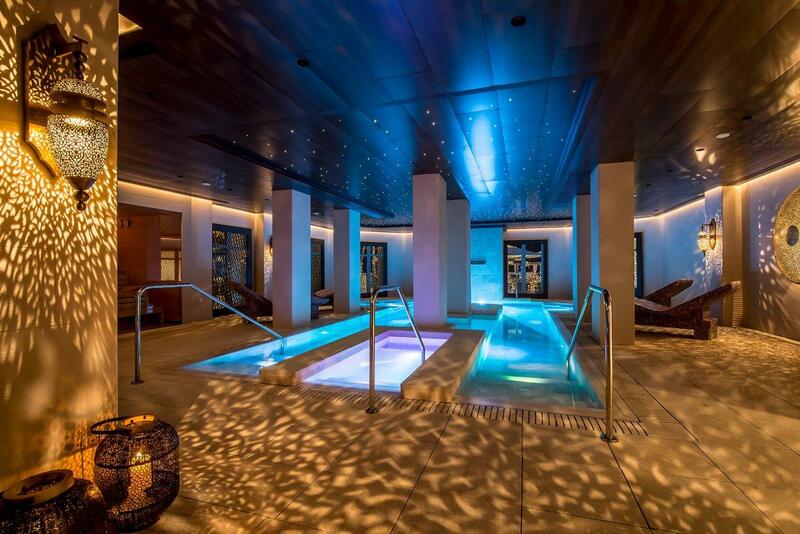 It’s a spectacular space. Admittedly in there is a business conference in the hotel, then the atrium can at times feel crowded and less sophisticated, yet enjoy this space in the early morning – or better till, in the late evening, with an after-dinner digestive in hand, whilst relaxing on one of the sumptuous sofas, and one starts to feel the magic of a bygone age in hospitality. The Hotel faces the Mediterranean, separated fromm the beaches by the coastal road that runs west out of the city. In these gardens, one finds the outside pool, the al fresco dining areas of the main Mediterraneo Restaurant, and plenty of space for corporate evets, and weddings. 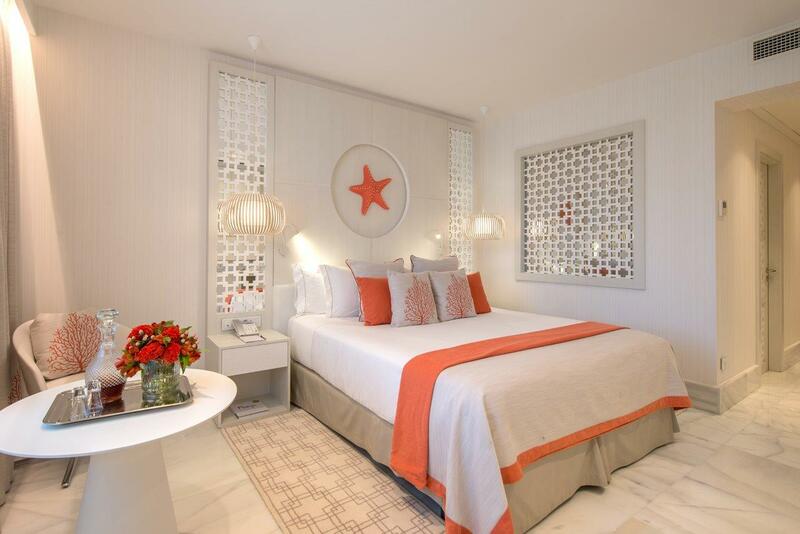 Guest room design is the work of designer Aneta Mijatovic, together with Rosa Escribano and José Segui. Extravagance, theatre, history and panache define the memorable rooms. 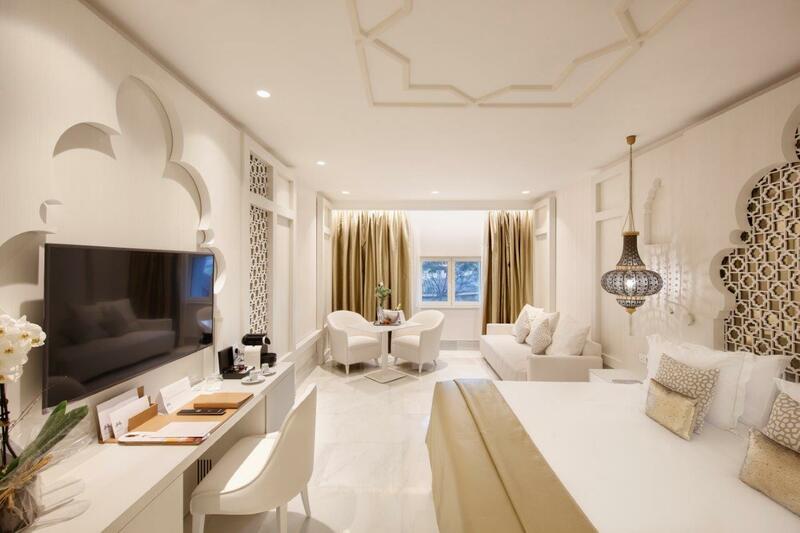 The floors of the hotel differ, with three main themes defining each guest level; Arabic/Al Andalus; Mediterranean; or Classical. 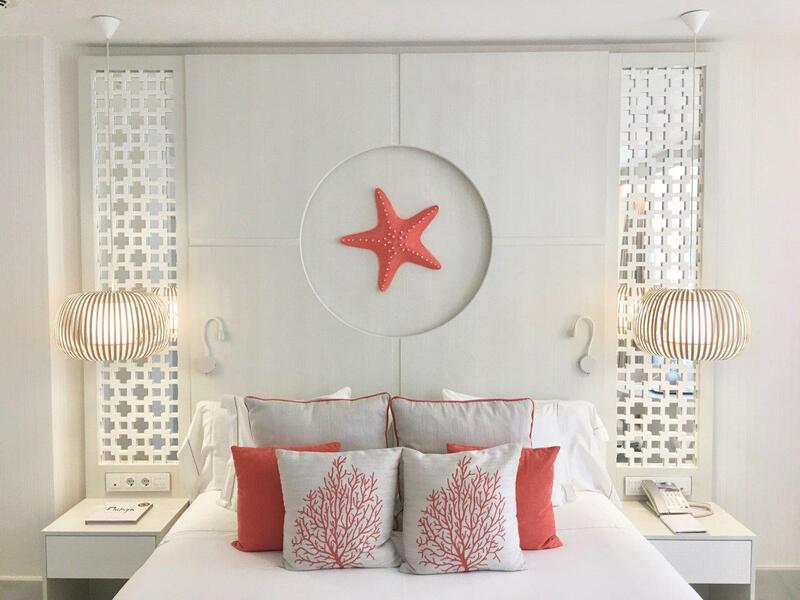 There are three categories of guest room – Premier, Deluxe & Deluxe Sea (the first two have city or garden views); and two suite categories, Suite Deluxe or for a sea view, Suite Deluxe Sea. 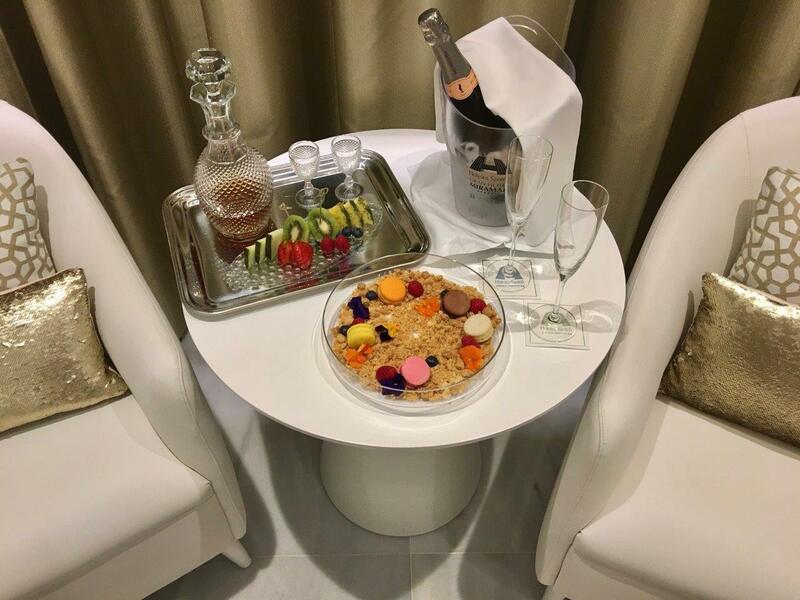 There are two extraordinary signature suites, the Crown Suite (with a circular bed! 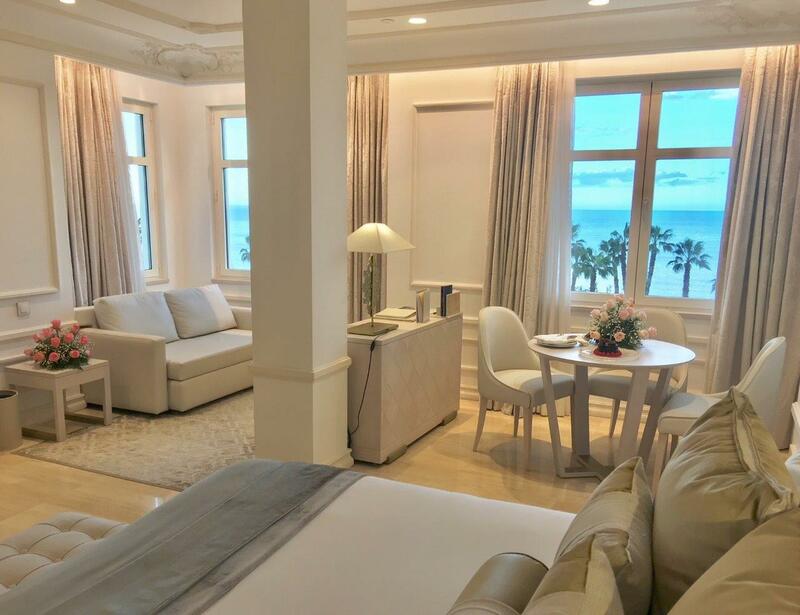 ); and the Royal Suite with its exceptional and expansive private, sea facing terrace. During my two nights stay I tried both a Premier Room and a sea facing suite. 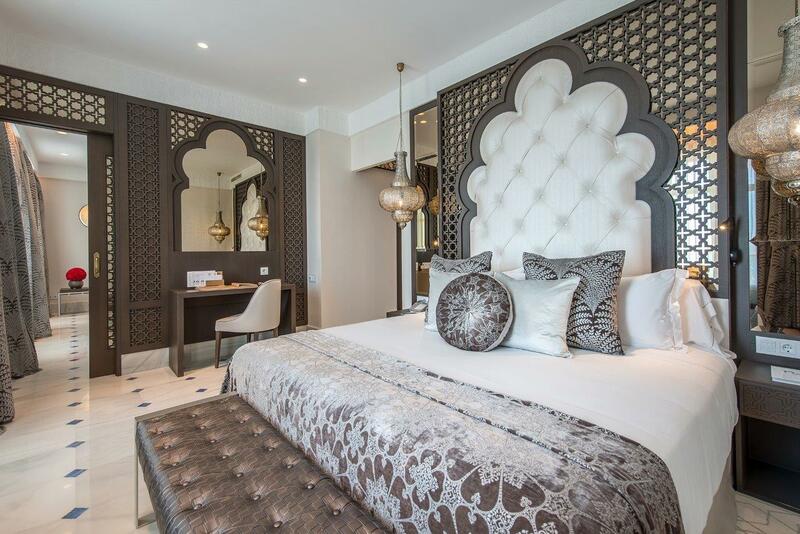 The Premier Room was in Arabic style, a gloriously fun play on exotic, fairy-tale style – think 1001 Arabian Nights. It was in extravagant gold, contrasting with brilliant white. 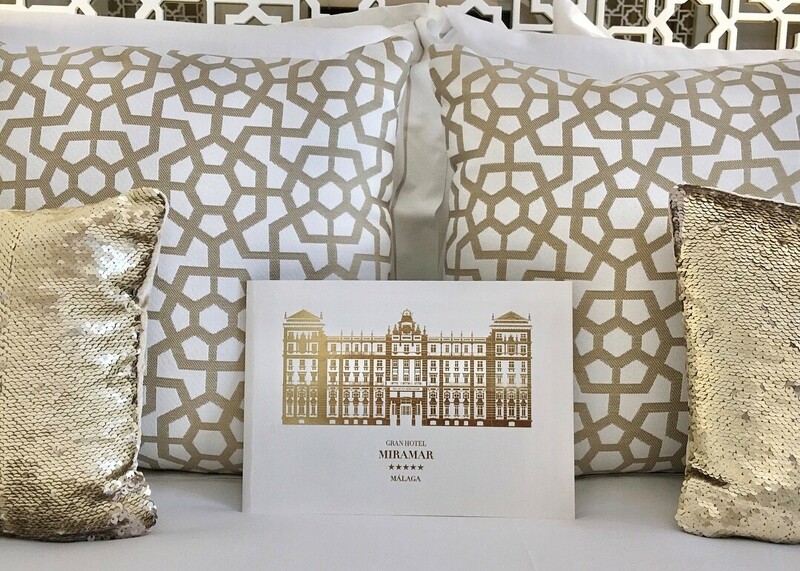 My second night in the suite was a more classic affair – ornate ivory plaster detailing, classic pictures, and subtle tones of whites, creams, ivory and gold. 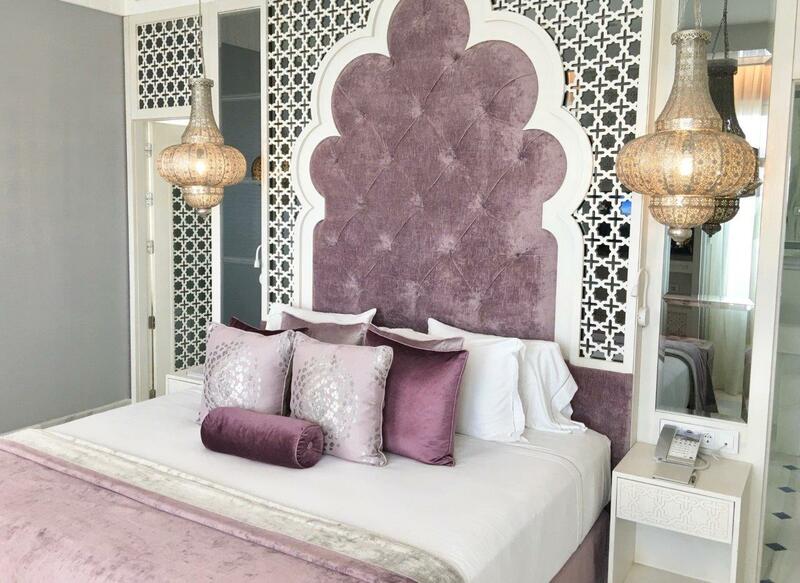 By contrast, the Mediterranean rooms are contemporary and relatively understated – ideal for clients looking for a fresh, modern take on Andalusian style. Personally, I would have loved to have seen a few more Malaga touches in the room – maybe a Malaga cake or treat at turn down. I think there is plenty of opportunities to celebrate the unique and fascinating history and culinary culture of the city. However, it was lovely to see in the room a crystal decanter of local sweet wine (reflecting Malaga’s famous sweet wine heritage) so one can enjoy an authentic toast. Cheers! Or better still, ‘Salud!’ as they say in Andalucia! 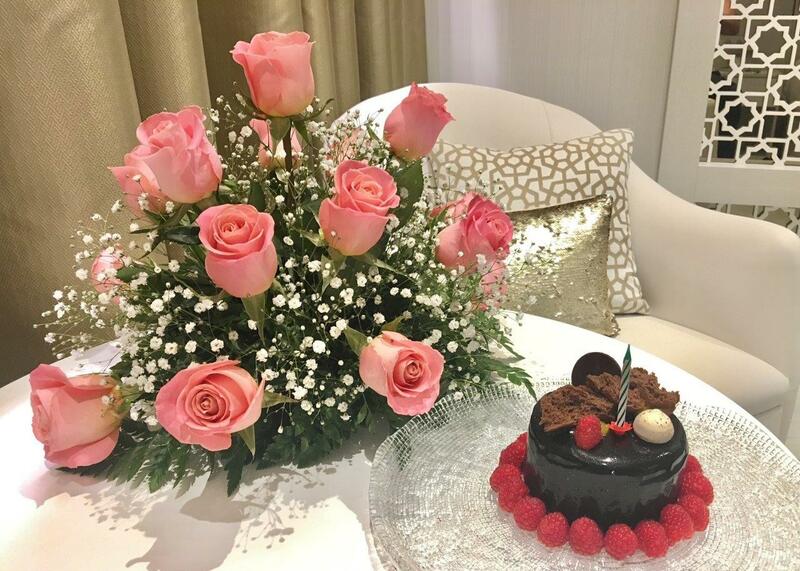 It was my birthday whilst I was staying at the hotel, and the team at check-in must have noticed, and later upon returning to my room I discovered fresh flowers, a beautiful chocolate cake! A very thoughtful gesture. Throughout my stay I found the team to be very friendly and helpful. 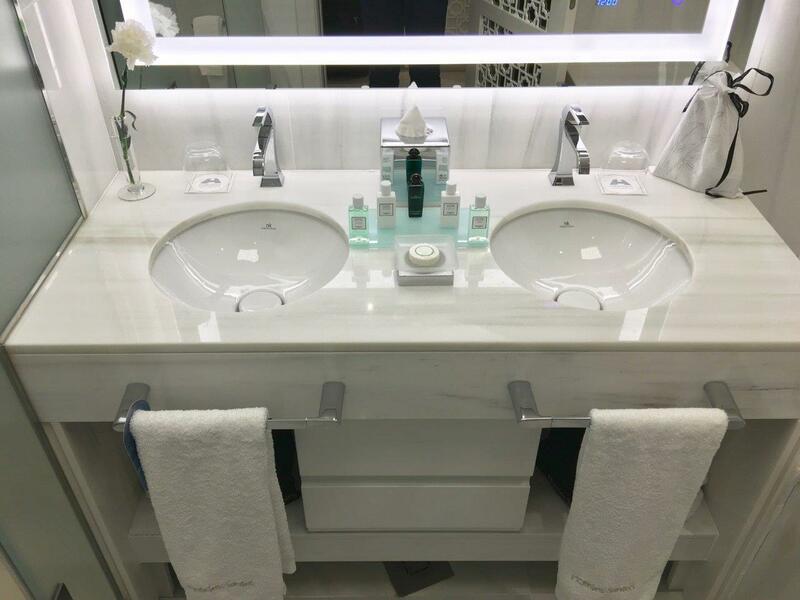 The hotel is within walking distance of the city centre and old town, offering a wealth of Spanish tapas bars, local taverns and some upscale dining. Yet the hotel has a compelling fine-dining restaurant, the Brasserie Príncipe de Asturias. 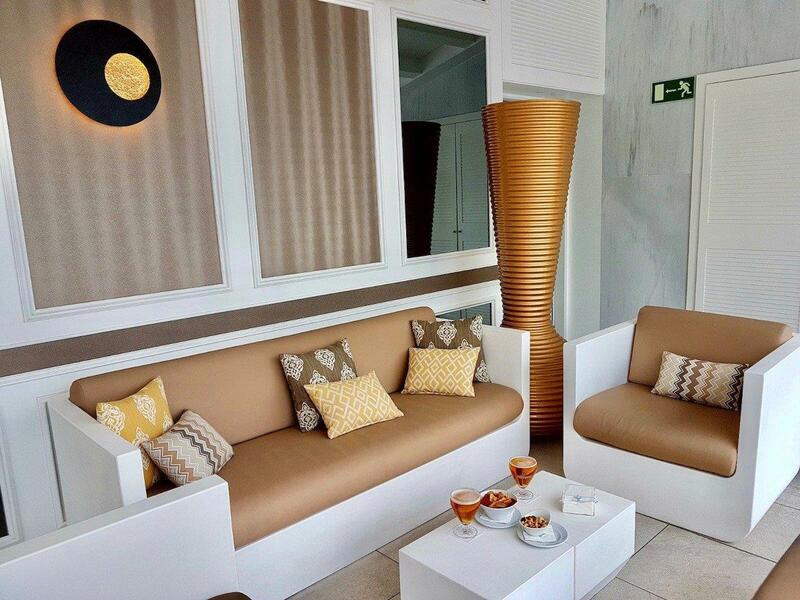 Here the menu focuses on gourmet products from across Iberia, as well as international gastronomy. 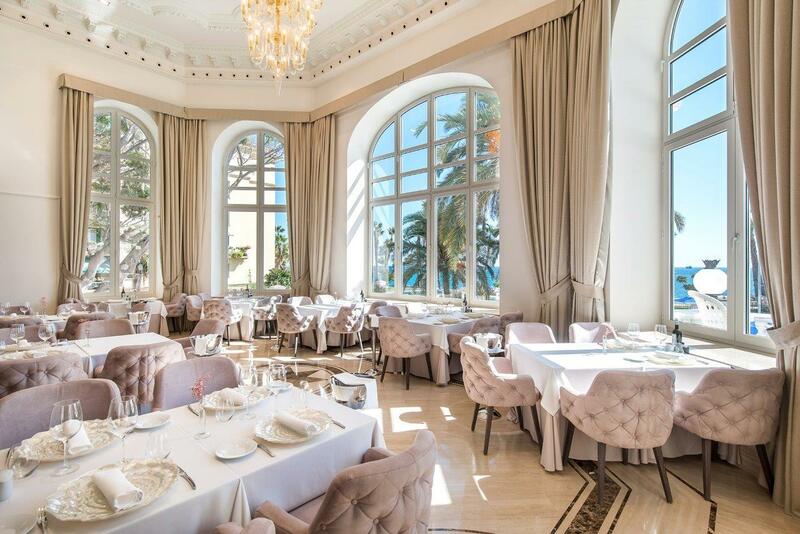 The Gran Hotel Miramar’s Head Chef Diego Nicás and his team also regular creating spectacular gastronomic galas for the city’s major cultural events. 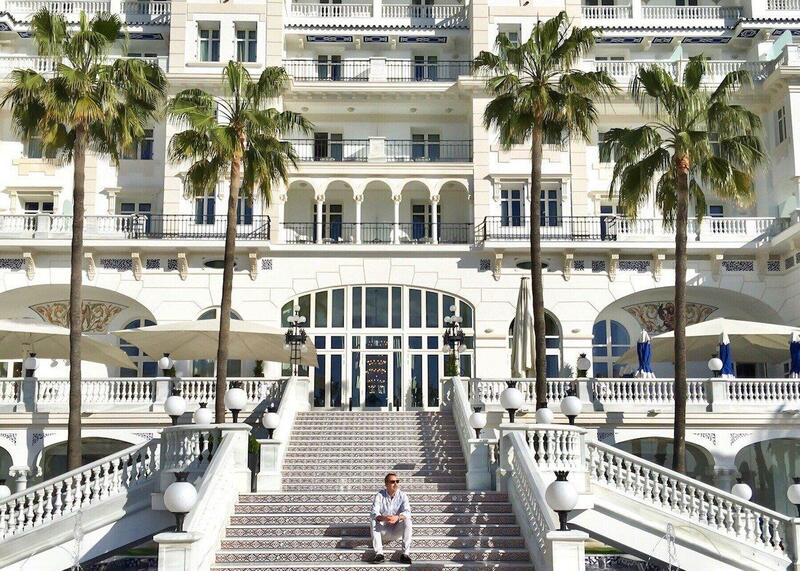 Just recently the hotel hosted a Michelin star-studded gala dinner for the 21st Festival de Malaga Cine end Espanol. This major gastronomic event was an exclusive collaboration of culinary talents of Spanish and Latin American cuisine – including Michelin-starred Chefs Benito Gomez and Diego Gallegos. 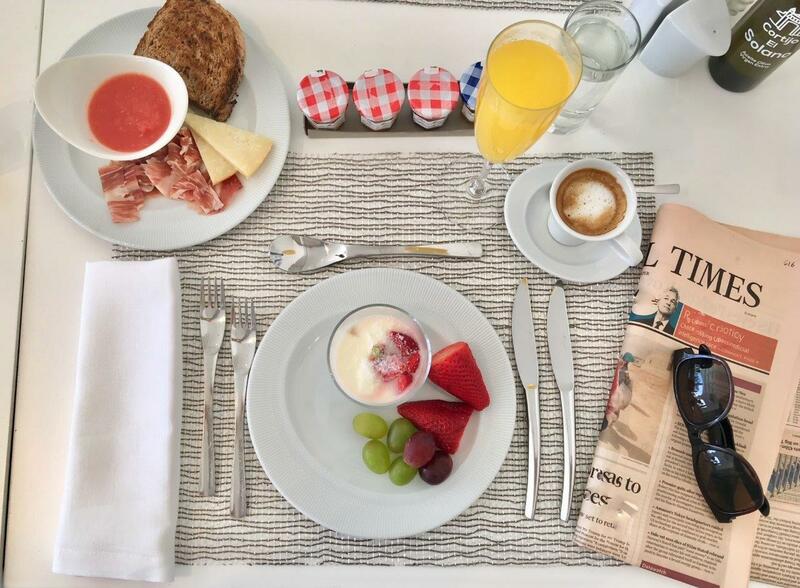 I recommend that one savours Breakfast at the hotel. 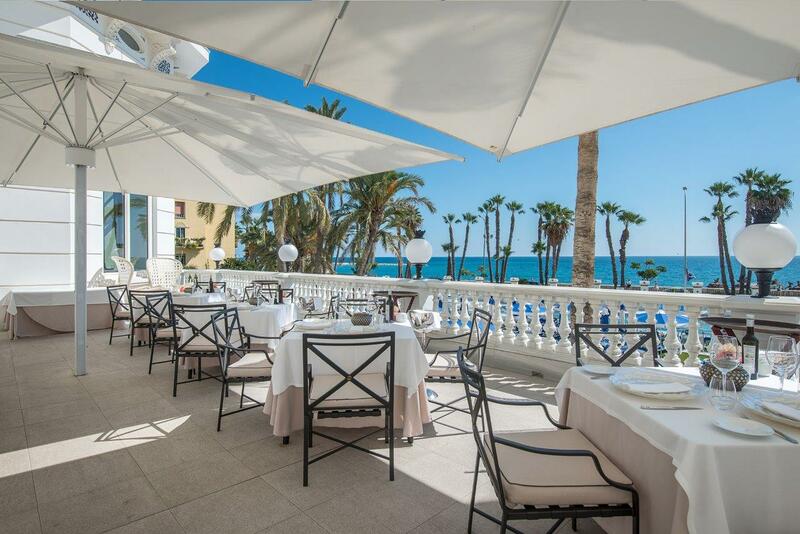 Served in the Mediterráneo Restaurant on the ground floor, the selection of products and dishes is excellent, encompassing local specialities, gluten and lactose free products; and the expected selection of fresh fruit, cold cuts, cheeses etc. as well as a very wide selection of cooked foods. Breakfast is buffet style and there isn’t an a la carte selection, but their buffet is generous and well presented. This restaurant also offers lunch and dinner inside and outside on the terrace. This roof terrace must be, in my opinion, one of the best parts of the hotel. 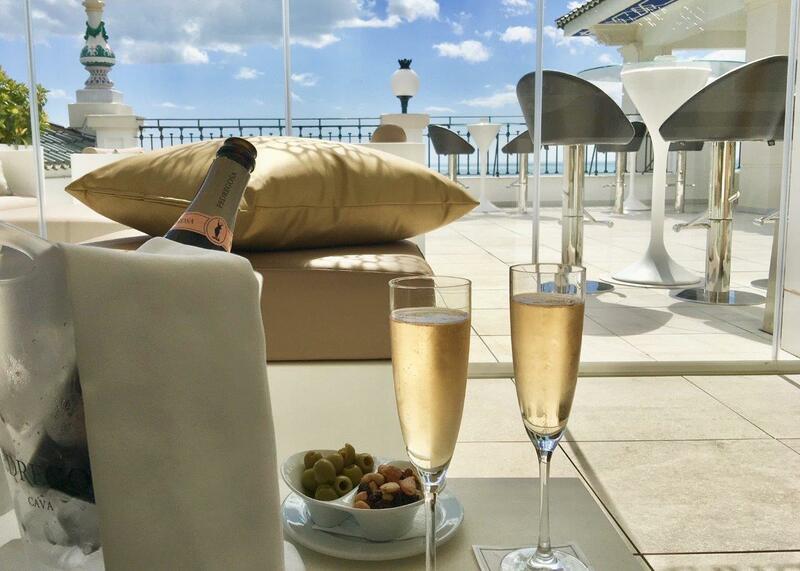 It’s a cool, stylish all-season bar that opens out onto a large roof terrace with designer furniture – and yes, panoramic views out across the Mediterranean. It’s a place for light bites, drinks and cocktails. 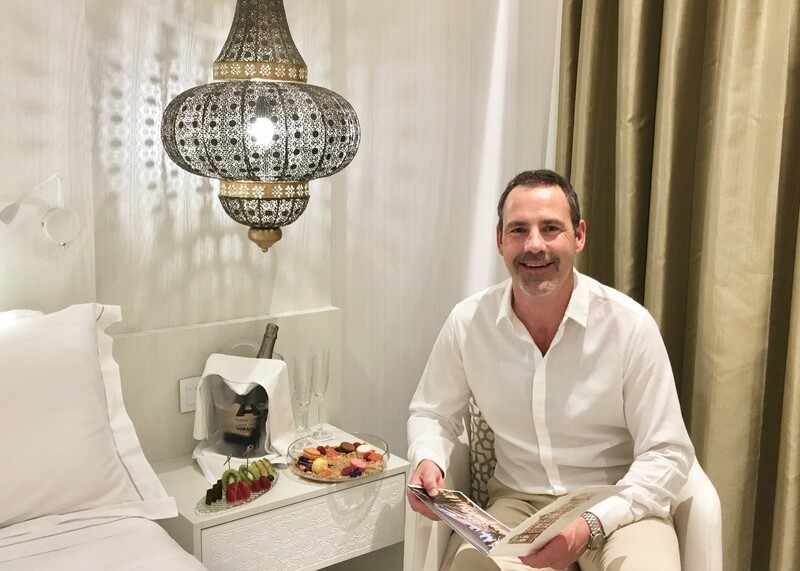 Of course, no 5-star hotel, these days, is complete without a wellness centre. 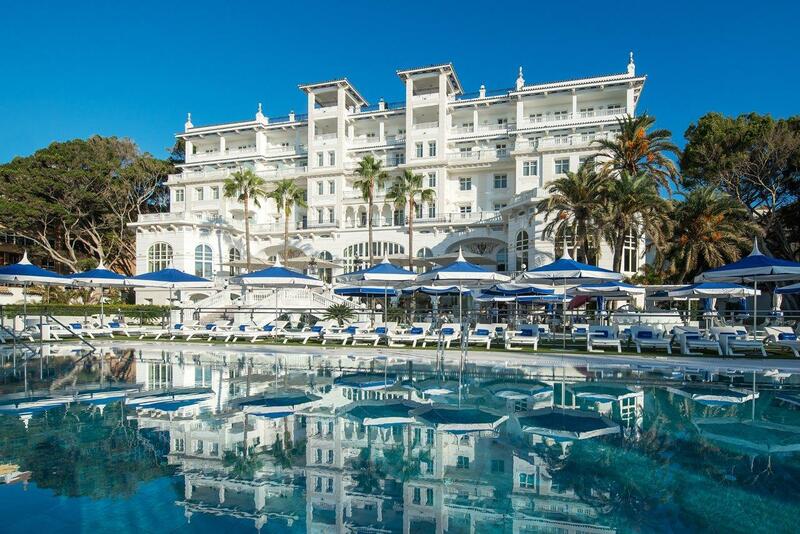 The Gran Hotel Miramar is no exception; with a comprehensive spa and wellness centre that covers two floors and includes an indoor pool, a thermal water circuit, spa treatment rooms, classic sauna, hammam, ice fountain, Jacuzzi, and a tranquil relaxation area with a ‘sensations’ pool. 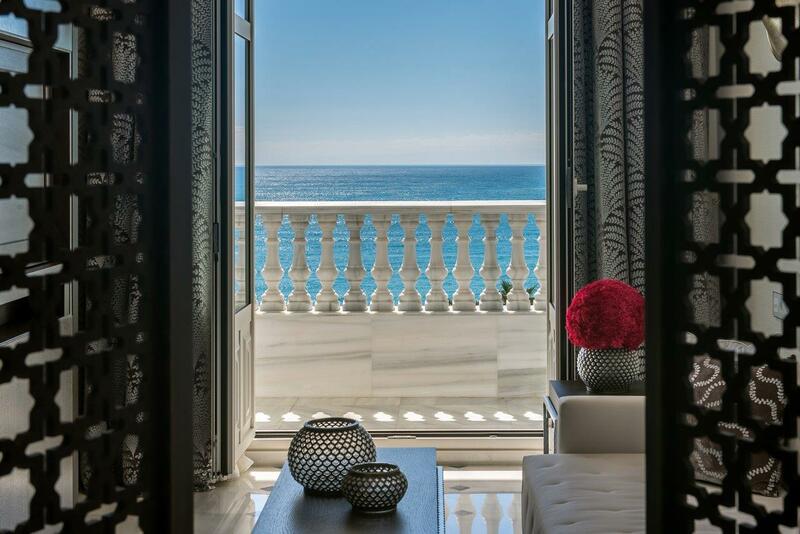 So, if the world-class art galleries, the award-wining local gastronomy or the Andalusian warm welcome wasn’t enough to draw to Malaga before, maybe now there’s a fancy Grand Hotel it’ll be on your destination list for 2018.